Rebecca's Thimble is sure to be a favorite! 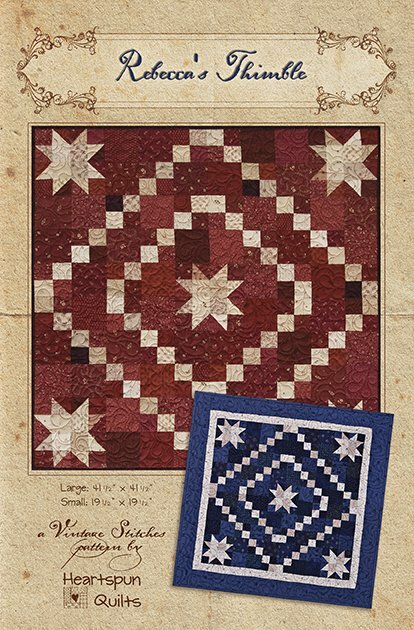 Featuring Star and Double Four Patch blocks, this easy to piece pattern has an eye-catching design! The pattern includes directions to make the quilt in two different sizes, and each version has options to complete it with or without borders. Notice my blue version has borders, and the red version does not. Either way, the quilt looks just great! It's a wonderful use of scraps, too. All blocks use modern rotary cutting and piecing techniques. Make your quilt in any color you'd like! The blue quilt as shown measures 19 1/2" x 19 1/2". The red quilt as shown measures 41 1/2" x 41 1/2".